His icy stare is compelling me to CLICK THAT LINK but no, I will not! I will muster all the will within my soul to do anything other than click that link. 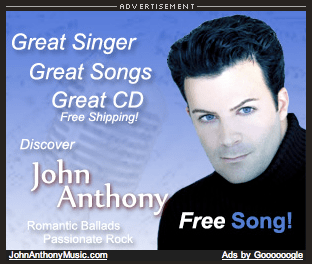 Begone, John Anthony! You are almost as terrifying as the Hypnotoad. Wow, he really does sound like Dennis DeYoung. And… um… that’s about all I have to say about that. My only other comment (before I must leave the site in haste, lest I become hypnotized) is that I think he must have stolen away Paul Todd‘s webmaster. In fact, the Paul Todd similarities seem to go deeper than the bitchin’ website. He really needs an animation that morphs between a photo and cartoon of himself, though. OK, that was an incredibly lame title; I guess I’ve just read too many headline puns in Entertainment Weekly over the years. A few weeks ago I took a training course for work. The course was not actually on Office 2007, but the computers in the training room were equipped with it, and it did come into play a few times. This was my first exposure to this version of Office, and needless to say I was stunned (and not necessarily in a good way) by the radically altered user interface. Credit where credit is due (so Microsoft will not sue, since this image is surely copyrighted), I swiped this screenshot from here. Maybe it’s just the effect of Steve Ballmer‘s voice ringing incessantly in the ears of their developers, but Microsoft actually has the audacity to suggest that this “ribbon” reduces clutter. Never mind the fact that you likely will have no idea where your formerly familiar menu options have gotten off to in this sea of buttons. And do not for a moment ask yourself why, if the tabbed ribbons have replaced the menus, they couldn’t have at least given them familiar names and organization (“File, Edit, View,” etc.). Maybe I’m too “old school.” Maybe I’m a “dinosaur” or a “curmudgeon.” Some have made the valid argument that this interface may in fact be more intuitive to a new user who’s not familiar with the older versions of Word, Excel and the rest (yes, PowerPoint and Outlook are the Professor and Mary Ann of Office). But I have to ask this: how many people who are going to be using this really have never used Word (or for that matter, a computer with a GUI) before? And even if they haven’t, is an interface that assaults the new user with no less than sixty-one (according to my count in the above screenshot) buttons, tabs, or other clickable thingamabobbers, really going to instill in them a sense of ease, comfort and self-confidence at the keyboard? But the ironic beauty (for us Apple fanboys) of this new interface is more than skin deep. For me, the most, erm, (I’ll use the word again) stunning thing about the interface is the magical, shiny, multi-colored and oh-so-enticing (yet strangely off-putting) Office button in the upper left corner, which not only beckons to you like a mercury-flavored Spree in this screenshot, but in fact pulses (yeah, that effect was cool in 2001) to the point of literally begging you to click it. But only click it once. For if you click it once, it spreads before you the most wondrous, the most essential (and for that matter, just about the only) menu in the entire application, containing options for opening, saving, printing and whatnot. Yes, that guy was in a picture on this page. I went to Microsoft’s website, looking for information about Windows Vista, and the first human face I encountered was that of Andy Samberg‘s stoner (or would it be “stoner-er”?) little brother. OK, well… I don’t really know how to wrap this up. It’s almost 2 AM and I’m spent. I might go weeks minutes before I can find anything more to criticize about Microsoft. But don’t worry, when I do, you’ll be the first to know. Print (or save) that photo! 1. Click on the picture you want to print, so it appears by itself on the page in the larger size. 3. The page will reload displaying the full-size picture, which will most likely be too big to fit in your browser window. 5. Now you can print the photo by choosing “Print” from the browser’s “File” menu (or by clicking the print button, if your browser has one). 6. If you want to save the picture, do everything up through step 4, but instead of choosing “View image” from the menu, choose “Save target as…” or “Save image to disk” or something to that effect.